Sincere well-intentioned Americans are asking, “What must we do to heal the racial divide following the Zimmerman trial?” What my naïve fellow Americans do not comprehend is that the Democratic party and the mainstream media are heavily invested in keeping racial tension alive. The American people have proven their eagerness to put race behind us by electing the first black president, exempting him from the usual vetting process of one seeking the position of leader of the free world. Given his ties to anti-American far left radicals, weak credentials and under-reported excess baggage, Obama would not have been elected president if he were white. Lets address the question of what to do to heal America's racial divide. The first thing I would do is enact a 50 year moratorium on Al Sharpton and Jessie Jackson having access to TV cameras and microphones; banning both guys from media appearances. Second, I would disband the NAACP and the Congressional Black Caucus. Both these groups have abandoned their higher purpose to become scam artists – shills for conning blacks into embracing a socialist/liberal agenda. Real black empowerment is no longer their mission, quite the opposite. Both groups are hostile to self-reliant empowered black role models. 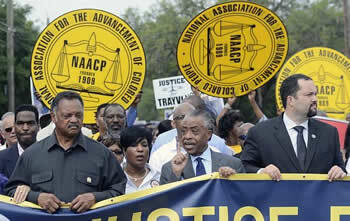 Exploiting race is the meat and potatoes of the NAACP and CBC's modus operandi. Another thing I would advise Americans to do to begin racial healing is stop watching most of the mainstream media; particularly CNN, MSNBC and other agenda driven networks. For crying out loud, NBC broadcast their doctored Zimmerman 911 call to make him appear to be a racist. Does that sound like NBC desires racial healing? I pray Zimmerman's lawsuit against NBC reaps him a huge financial reward. Exploiting race is so effective, evil and divisive because racial loyalty runs deep. I was surprised to hear a few fellow black conservatives parroting the liberal media's spin of the Zimmerman trial. Racial loyalty explains why otherwise bright blacks became brain-dead Obama voters in 2008. Political hacks such as the DOJ's Eric Holder who called for a “national dialog about race” are themselves the problem – fueling the flames of racial division. In reality, racial healing is Holder, Obama and company's worst nightmare. To racially heal our land, justice must be distributed equally rather than politicians pandering to voting blocs; each jockeying for top victim status. Cease making excuses and exempting people-of-color from obeying the law to win their votes. Allow me to recap. To begin racial healing in America we should shut up Sharpton and Jackson, close down the NAACP and CBC, cease watching agenda-driven media, stop dividing Americans into victimized voting blocs and last but not lease; allow the American people to be who they truly are, fair-minded, decent, compassionate and generous without government interference. Every day in every way, Americans are getting along really well. Race problems are not that big of a deal. I know. I know. Some of you are going nuts over my statement. But, it is true. Blacks and whites are working, playing and having babies together. Am I saying racism no longer exist? Absolutely not. Like every other sin, racism will survive until Jesus returns. All I am saying is that racism is not the major problem that Democrats and the mainstream media are so committed to having you believe; while they promote and nurture racial division. If the race hustling pimps in the so-called civil rights movement and the MSM would get out of our way, we Americans will work out our racial issues. I advise my fellow Americans to continue spreading a little love and forgiveness which is what the silent majority have been doing for years. So, there you have it folks. This is how we achieve racial healing after the Zimmerman trial. As always, it is up to us, every day Americans who make the country work to bring about racial healing; not the race baiting liberal elitists. We are Americans, good people blessed by God.